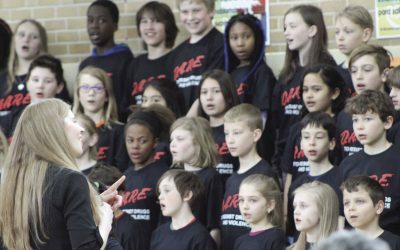 Jill Elsberry engages a group of fourth graders in her D.A.R.E. program. She is currently in her third week teaching the program to schools at Littlefork, Indus, and Northome. 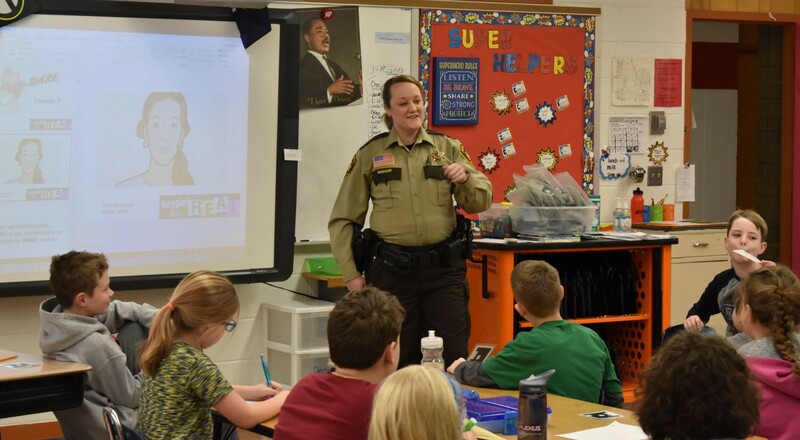 Jill Elsberry, part-time Koochiching County sheriff’s deputy and part-time International Falls police officer, is the county’s new D.A.R.E instructor. 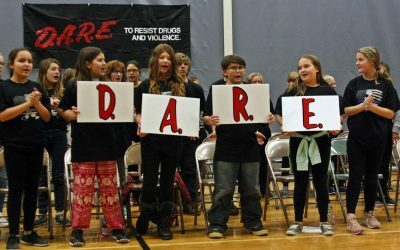 D.A.R.E stands for Drug Abuse Resistance Education. About me: I began my career in law enforcement 15 years ago in North Dakota. I have experience in both adult and juvenile corrections, 9-1-1 dispatch, and also as a licensed peace officer. I moved here three years ago. I have two sons, Tyler, a freshman at Falls High School, and Gavin, a fourth grader at Falls Elementary School. My husband, Andy, and I are anticipating the arrival of a baby boy next month so teaching D.A.R.E at eight and a half months pregnant has been interesting. 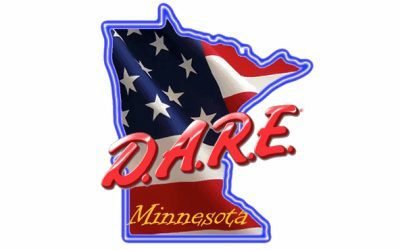 History with the D.A.R.E program: I have previous experience teaching law enforcement courses back in N.D. but teaching kids in a classroom setting is something new. 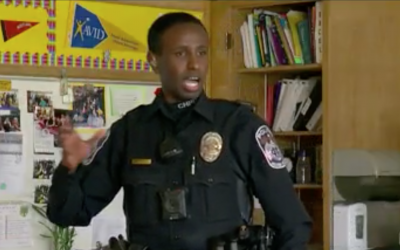 When I grew up, we had a local police officer come into our classroom and teach us about drugs and gangs. I remember it being called the “Just Say No” (to drugs) program. 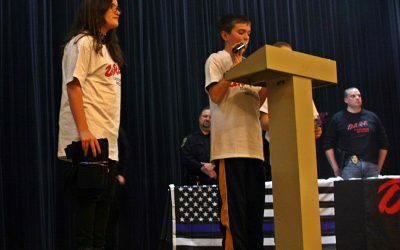 When I attended my oldest son’s graduation from the D.A.R.E program, I saw how much pride and effort the police officers put into the program. It was a big deal for the students, teachers, and the community to have another graduating class of students. About the training: When I was asked if I would be interested in teaching D.A.R.E. I was very eager and excited for the opportunity. The instructor training course was put on by the MN Bureau of Criminal Apprehension in St. Paul, Minn. There was a fairly extensive application process and requirements to be met before being accepted into the program. For example, D.A.R.E. requires each applicant to be an officer for a minimum of at least two years. I was warned that the training would be intense and very mentally exhausting — which was true. The certified portion was 80 hours of instruction, but that didn’t include the numerous hours of homework and prep to be done outside of class. Throughout the training there were many milestones that were either pass/fail and it was made very clear that you either have it in you to teach or you don’t. The course not only covers the curriculum but it also teaches you how to be a teacher in a very short amount of time, which was the most important part of the course for me to learn because teaching the subject material isn’t as hard as managing the classroom itself. Our final evaluation included teaching lesson plans to a real classroom of students. I taught a group of kindergartners and also a fourth grade classroom. It was neat to see the entire course come full circle and hear stories from other D.A.R.E instructors on what kind of an impact they made in their communities. They all had examples of how they strengthened the relationship between the police and the public because of D.A.R.E. It was definitely an inspiration for me. What I’ve learned so far: To be completely honest, I thought D.A.R.E. was a similar ‘say no to drugs’ program because the acronym stands for Drug Abuse Resistance Education but after attending the 80 hours of instruction, I realized it’s so much more than that. 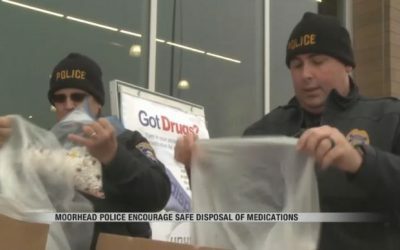 The idea is to teach kids how to make safe and responsible decisions in life whether at school, home, or with their friends using a 4-step process called the D.A.R.E Decision Making Model. There are lessons involving bullying, peer pressure, internet safety, ways to effectively communicate, and avoidance strategies, among others. The curriculum has lessons geared for pre-K students all the way through senior high. In our county we have been teaching at the sixth grade level but I’m hoping to also incorporate younger and older age groups as well. Looking to the future: I am currently in my third week teaching at three area schools — Littlefork, Indus, and Northome. I plan on teaching a minimum of 10 lessons and having a graduation ceremony for each class. The timeline will be based on the arrival of my unborn child, and so far, teaching has been going great. I’m getting a lot of classroom participation and excitement from the students. I’m also looking forward to incorporating fresh new ideas to help expand the program in the years to come. I want to thank area businesses that have and will continue to support to the D.A.R.E. program in our community. The previous instructor for the county was Koochiching County Sheriff’s Deputy James Kennedy, who taught the program for the past 13 years. “Deputy Kennedy did a great job and was very dedicated to the program over the past several years,” said Koochiching County Chief Deputy Jon Froemke, adding that he’s also thankful for Elsberry’s commitment to the program. 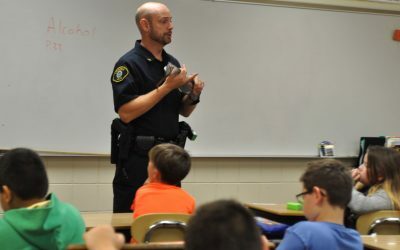 “It is no small task, by any means.” The Falls’ school program is taught by International Falls Police Officer Dane Olson. Washington County Sheriff Dan Starry and D.A.R.E. 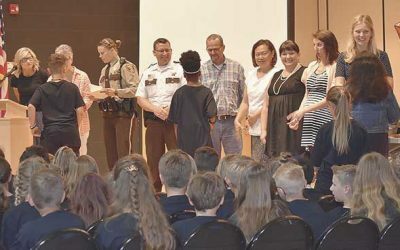 instructor Deputy Sheriff Kelly Olson attended Oneka Elementary School’s fifth grade graduation ceremony. Each of the 175 students received diplomas. 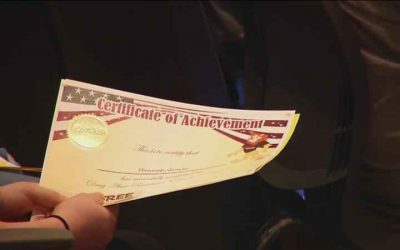 Nearly 90 Falls High School students giggled and leaped across the Backus Community Center stage Tuesday upon graduating from the Drug Abuse Resistance Education program. The program is taught by Koochiching County Police Officer Dane Olson, who went through the program as a youngster himself.